Well, that was fast. 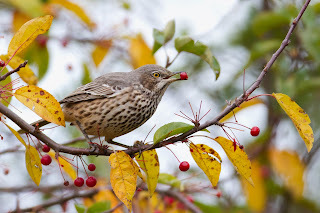 "The Big Year" came and went like a fall warbler in a hurry to go south. It didn’t hang around very long because box office duds never do. I liked the movie, did you? "The Big Year" wasn’t the only thing birdy about October. For chirping out loud, the Cardinals even won the World Series. Oct. 2: I was playing catch with my son and heard the distant bugle of sandhill cranes. We looked up and soon located five birds swirling around, enjoying the warm sun just like us. November is prime time for “sandie” sightings, often in large migrating flocks, so be alert for these spectacular birds. Oct. 8: My only full morning of birding. The site was St. James Farm Forest Preserve in Warrenville, where we’d moved the regular Cantigny Park bird walk—for variety and because St. James is new territory for most local birders. And that includes me. Until last June I’d never set foot inside the 600-acre preserve, located immediately south of Cantigny. It’s an “underbirded” venue with excellent habitat variety. Our band of 75 birders found 42 species (plus a coyote) on a day that felt more like summer. For now, on most days, St. James is quiet. Public access began only in 2007, when the Forest Preserve District of DuPage County officially took possession of the property from the Brooks McCormick estate. Since then the preserve has gradually ramped up toward a goal of daily visitation, a process that continues today. St. James is open through November but then closes until Memorial Day weekend in 2012. It lacks a paved parking lot so winter visitation isn’t yet possible. Full 365-day access will likely begin sometime in 2013. I made two more short visits to St. James in October. For natural beauty, history and birds (including wild turkeys), it’s a great place to go. Oct. 13: I arrived home late from the DuPage Birding Club’s fundraising auction. As I unpacked the car, with the garage door still open, a great-horned owl hooted softly. I stepped onto the driveway in hopes of seeing the bird but never did. No doubt it saw me. Oct. 14: The morning was special as the season’s first dark-eyed juncos appeared in my yard. These Canada nesters—some call them “snowbirds”—will be with us until late April. We are in the northern part of their wintering range. Marking their October arrival is an annual tradition. Oct. 17: I stepped into the backyard after work to check the feeders. A hermit thrush flew up from the ground-level birdbath, and then I spotted what appeared to be a feathered mouse scurrying across the bluestone and into the peonies. It was of course a winter wren, a secretive species that goes undetected more often than not. October is a good time to see one and this year I was lucky. Oct. 24: White-throated sparrows were regular in the yard from mid-October on, loving the millet I toss on the bare ground beyond my feeders. On this day, a pair of fox sparrows joined the feast. I noticed them at dusk and expected to see them again the next morning. Not to be, but another fox appeared the day before Halloween. One of my favorite sparrows. Oct. 27: At the office, late afternoon. I check IBET, the online birding list-serve, and learn that a red-necked grebe was reported at Fermilab 30 minutes ago. Gee, that’s only 6 miles away. By 4:15 I’m on the scene, standing at the edge of Lake Law with three other birders. Two of them have scopes fixed on the bird. Then more birders arrive, and a few more. It was a “lifer” for some, and it certainly felt like one for me. My only previous red-necked grebe was in Alaska in 2001, spotted from a moving train. This sighting was a lot more satisfying and enjoyed with friends. Nice. Oct.28: Sometimes I just need a red-headed woodpecker fix. When that happens I know right where to go: behind the First Division Museum at Cantigny Park, in the big oaks. I took a walk at lunch and easily found my target. Was this the bird that spent the whole winter at Cantigny in 2010-2011? If yes, will it stay again? Hope so. 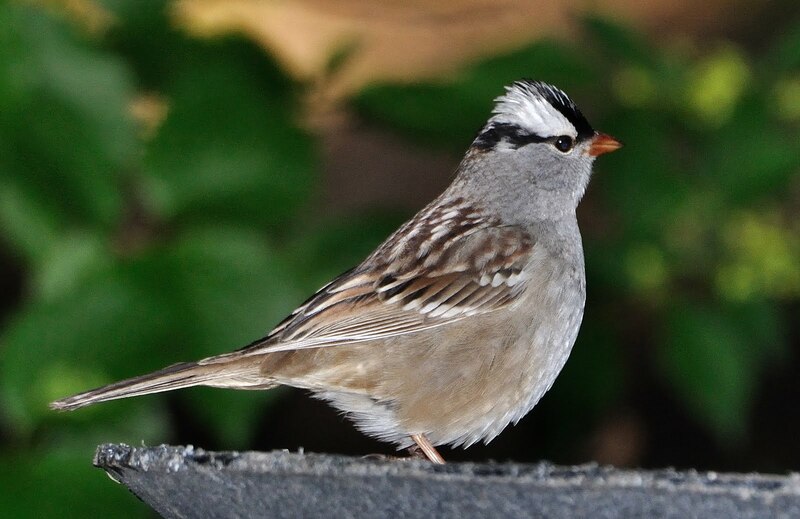 Oct. 29: A female white-crowned sparrow joins the backyard brunch. Hey, this millet trick really works! If you try it, start with just a few handfuls when the ground is dry. Oct. 30: A rather late-for-the-season golden-crowned kinglet stopped by the yard. As kinglets will do, it flitted around in perpetual motion, like a bird that’s had way too much caffeine. Now it’s November and the birding year is winding down. But it’s still an exciting time. Watch for those sandhill cranes, listen for owls, keep your feeders full, go on some bird walks and just enjoy whatever Mother Nature sends your way. The seasonality of birding is something to savor, one moment and one day at a time. This could be the biggest thing in the birding world since the announced rediscovery of the ivory-billed woodpecker. I’m speaking of “The Big Year,” an upcoming movie based on a true story that is sure to capture the attention of birders and nonbirders alike. Is America ready for this, a mainstream Hollywood movie about an over-the-top 365-day birding competition? We’ll soon find out. The film opens in theaters on Friday, October 14. “The Big Year” was a popular conversation topic at the Midwest Birding Symposium last month in Ohio. Most of us who attended agreed that even if the movie lays an egg at the box office it will still bring a lot of attention to our hobby. People who don’t care a lick about birds will go see it, if only for the all-star cast. The main actors are Jack Black, Steve Martin and Owen Wilson. “The Big Year” was first a bestselling book, superbly written by Mark Obmascik and published in 2004. It was so good that nonbirders read it, too. Excerpts appeared in Sports Illustrated. The book’s broad appeal was surely a consideration when 20th Century Fox decided to bring it to life on the silver screen. That decision would lead to a dream come true for Greg Miller, one of the real-life characters in the book. He is not exactly a household name in birding circles—certainly not as famous as some other speakers at the Birding Symposium, including Pete Dunne and Kenn Kaufman. But Miller’s star is rising thanks to “The Big Year” movie. 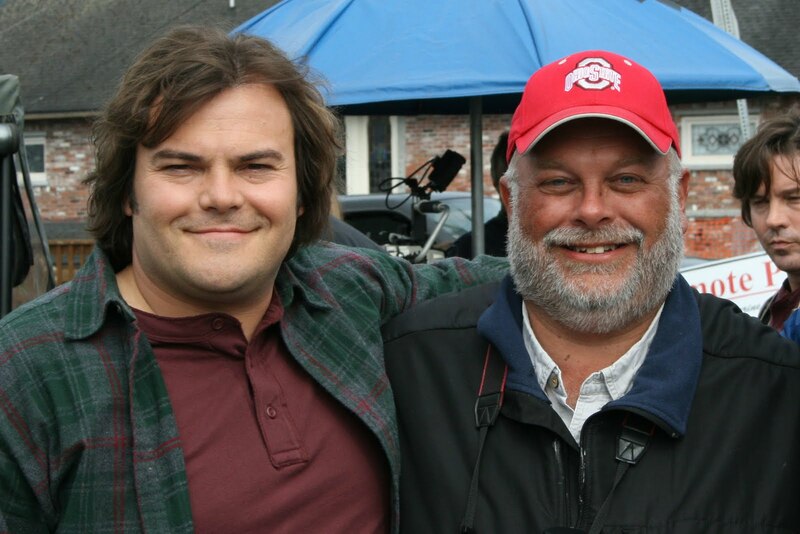 His character is played by Jack Black. It was fun meeting Miller in Ohio, his home state, and chatting about his involvement with the movie. He was on location for 15 days in 2010 as a paid consultant, hired to show the main actors and extras how to look, act and speak like birders. For training, he even took Jack Black on a two-hour bird walk around Stanley Park in Vancouver, B.C. The actor was wowed by the bald eagles. Miller has not previewed the movie but feels confident that the “heartfelt comedy” will be accepted and enjoyed by birders. He thinks the birding scenes will be realistic and that viewers will not hear random out-of-place bird calls. In the book, Miller was the one you rooted for, the underdog. His goal was to break the standing North American record for most birds listed in a calendar year (721 species). It was 1998. But unlike his wealthy and retired competitors, Miller was short on cash and pinched for time because he worked for a living. This made his quest a lot more remarkable. Miller says “The Big Year” film script deviates in many ways from the book. One of the biggest differences is that the story is set in the present. So the actors are seen using modern technology that makes birdfinding today faster and easier—GPS and smart phones, for example. Air travel, of course, was much different in 1998. Back then, Miller and his two competitors had no problem dashing through airports, hopping on last-minute flights to far-off places. They left a huge carbon footprint but the practice enabled all three to rack up more than 700 bird species for the year, an astounding achievement. “The thing that I’m most thrilled about is the effect it had on people who are not birders,” said Miller, speaking of his on-set experience. He noted that four out of the 170 people working on the movie became new birders, purchasing their own field guides and binoculars. If the same conversion rate applies to those who watch the movie, “The Big Year” will have a huge positive impact on birdwatching. Like Miller, I’m all for growing the hobby. Maybe Hollywood—and Jack, Steve and Owen—can help. I’ll be thinking about that when I buy my ticket and popcorn. In 2008, I applied to be a Boy Scout merit badge counselor. I submitted to a criminal background check, took the required Youth Protection Training, paid my fee and purchased a badge booklet at a Scout supply store. I was ready to serve. Well, apparently Bird Study is not a very popular merit badge. The phone never rang. After a year without a single inquiry, I let my counselor status lapse. None of this is too surprising. On local field trips, birders under the age of 20 are about as common as mockingbirds in Illinois. We hope to see them but rarely do. 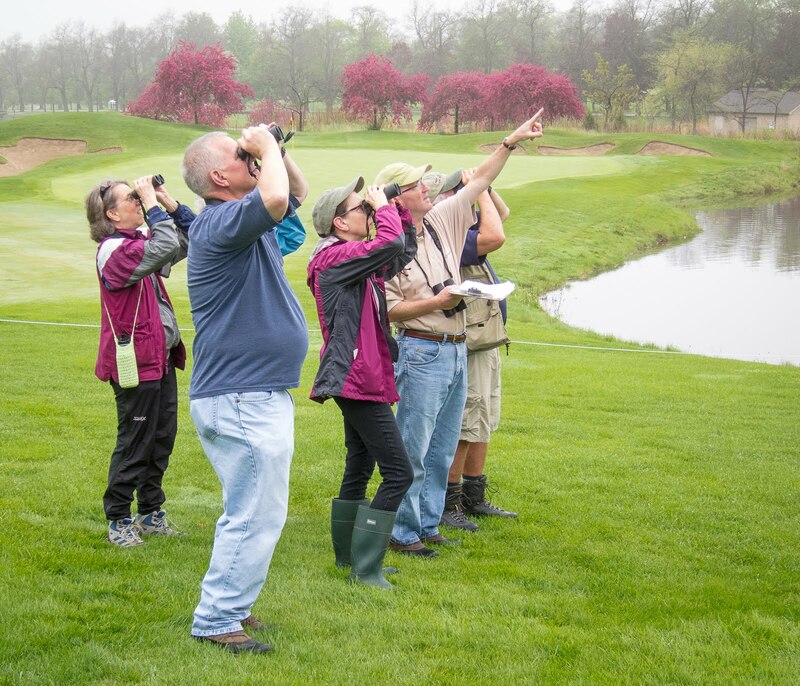 The monthly bird walk at Cantigny Park last month had a theme: “Take a Kid Birding Day.” Adults were encouraged to invite a child, a grandchild, a neighbor kid or any young person who might have an interest in birds. We were ready, with plenty of adult leaders ready to share their skills. 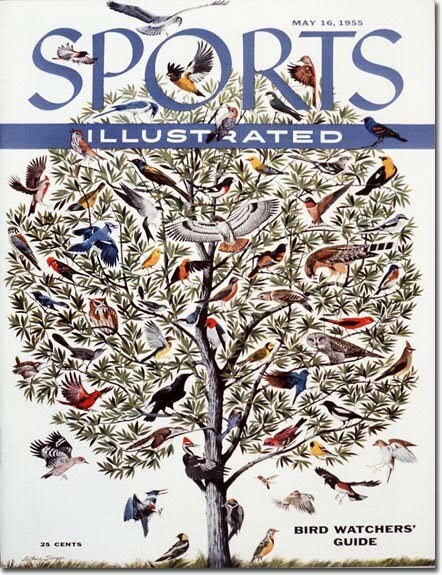 The park even purchased 50 copies of the “Peterson First Guide to Birds of North America” so that each child would have a book to use and take home. Turns out, two books would have sufficed. We all know that getting kids interested in nature—or just getting them outdoors—can be a challenge. The really encouraging thing, though, is that the two 11-year-old girls at Cantigny last month were enthusiastic, and it was by no means their first birding experience. By the end of the walk they’d exchanged e-mail addresses. Seeing those girls reaffirmed my belief that kids and birds are a good fit. It’s fun to see them get excited about sights and sounds that most of us take for granted. The key is to keep them interested by offering more opportunities for birding and steady encouragement as they explore the hobby. This is already happening, a good example being Illinois Young Birders. The club, ILYB for short, was founded in March 2010 as a special project by the Illinois Ornithological Society. So far it has about 30 youth members as well as adult supporting members and partner members such as the DuPage Birding Club. “The social element of our club is very important,” says Brian Herriott, ILYB coordinator. “Often, children that develop a great interest in a hobby like birding soon find that there are few peers who share that interest. The club is for ages 9 to 18. Organized field trips are the major benefit of membership, and parents are welcome on all of them. To learn more, visit illinoisyoungbirders.org. The next 20 youth members to join will receive a free copy of “Birds of Illinois,” a terrific book (for all ages) by Sheryl DeVore and Stephen Bailey. Another book I recommend is “The Young Birder’s Guide to Birds of Eastern North America,” by Bill Thompson III. There is nothing else like it—fun and light, but still very useful. Kids need decent binoculars, too, and some models are better for young birders than others. A good source is Eagle Optics, a Wisconsin-based mail order house that caters to birders. The Eagle website offers helpful information about binocular buying in general. But what I absolutely love is their package deals for young birders. The “Young Naturalist Kit,” for example, includes a good binocular for small hands and a copy of Thompson’s book, all for $130. Shipping is free. There’s another value-priced package geared to slightly older youth birders. To be sure, getting kids into birding is not expensive. 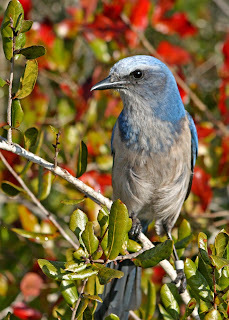 Guided bird walks are almost always free, and there are many to choose from. For ideas, check out the DuPage Birding Club website and the newsletter of the Forest Preserve District of DuPage County. Willowbrook Wildlife Center in Glen Ellyn offers some excellent youth programs. Kids can get up-close looks at the center’s resident birds, too, including hawks, owls and eagles. Not all outings are suited to children but most bird walks offer plenty of guidance. Many birders really enjoy sharing the hobby with youngsters. Don’t overlook the backyard either! Watching birds at home is an easy way to develop a child’s interest. Encourage him or her to notice what’s coming and going, and to keep a list of sightings. The list will grow quickly, especially if you have feeders. Try offering a few different kinds of food and also a birdbath. Keep the field guide and binoculars in a handy place. I know it sounds obvious, but the future of our hobby—and bird conservation—really depends on getting more young people interested in birds. Let’s all do our part to bring them along. Me? I recently joined ILYB as a supporting member and also reregistered with the Scouts. I’m a Bird Study counselor again. When the phone rings, I’ll be ready. There is an iconic work called “Nighthawks” hanging at the Art Institute of Chicago. The Edward Hopper masterpiece is dark and a little mysterious. I’ve always liked it, including the name. The painting has nothing to do with birds, of course. The “Nighthawks” are those three customers in the diner. But the picture always reminds me of one of my favorite birds, the common nighthawk. I’ve been watching them since the mid-1990s when I saw my first ones in Chicago. Later this month I’ll be admiring them all over again—a yearly ritual that never gets old. I love telling new birders about the nighthawk because it’s often a bird they not familiar with and yet one that is easily observed. Mid-to-late August through early September is the peak viewing time for this area. Go outside around dusk and with a little patience you are almost certain to see one or more common nighthawks cruising by. With luck, you might see a large flock. I’ll never forget an ice cream social we attended at Benjamin Franklin Elementary School in Glen Ellyn about 8 years ago. It was and maybe still is an annual event, held on the evening of the first day of school. It was good to see old friends, meet Rachel’s new teacher and have a sweet treat. But what I remember most is the nighthawks. Gobs of them were swirling overhead, feeding on the wing. Conditions evidently were perfect for this avian phenomenon. 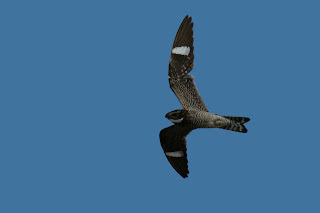 “Pete Dunne’s Essential Field Guide Companion” describes the common nighthawk as “a wheeling, drunken-looking, falcon-like bird feeding high overhead at dawn and dusk.” The longish, pointy wings are what liken the nighthawk to a falcon, but the species is not related to falcons or even hawks. Nighthawks belong to a family of birds called the nightjars, which includes the whip-poor-will. Something I just learned is that common nighthawks are also closely related to owls in terms of DNA composition and morphological structure. Dunne’s “drunken” reference relates to the nighthawk’s distinctive flight pattern. The wing beat is irregular, resulting in a floppy but darting aerial behavior that is very entertaining to watch. The birds are catching insects, which they accomplish by flying straight into them with their mouth and throat wide open. The body of a common nighthawk is about the same size as a robin but their long wings make them appear much larger. What you may notice first is the white patches near the end of their wings. These markings are obvious so identification is easy in good light. As you get to know nighthawks better, you’ll be able to ID them by sound, too. They have a one-of-a-kind call that is loud and buzzy—“beeeez’t,” according to Dunne. In my last column I mentioned hearing that sound after a June baseball game in Iowa. I never did see a nighthawk that evening but it was cool to know they were in our midst. Like giant moths, the birds are attracted to the bright lights of stadiums and parking lots, where flying insects are plentiful. Occasionally you might see a nighthawk in broad daylight. Once I spotted one during an afternoon ballgame at Wrigley Field. The bird landed at the base of one of the light towers and that’s still the only time I’ve ever seen a nighthawk sitting still! The common nighthawks we’ll see this month in DuPage County are migrating. They have a long journey ahead, so all those bugs they’re eating will serve as fuel. Their destination is South America, on the east side of the Andes from Ecuador to Argentina. 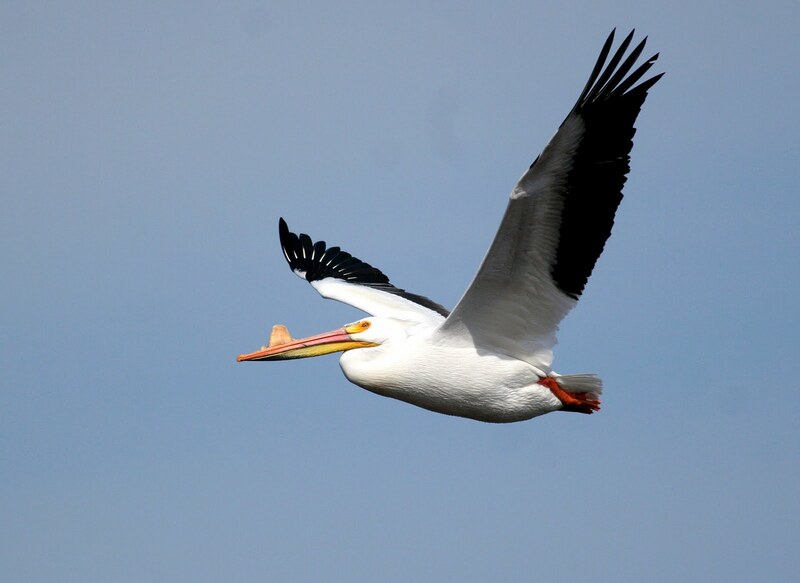 To see these fascinating birds on their way, start watching the skies after 6 p.m. If you have a decent amount of open sky the backyard patio will do just fine. You’ll likely see some solitary birds flying quite low and maybe some swirling flocks up higher. Calm, clear evenings are best for viewing. Give it a try! Birdwatching and birding are the same thing. I believe that. But there is a sense within the hobby that “birding” is a little more serious. So a few years ago the DuPage Birding Club asked its members to contribute ideas about what makes a birder. Their responses, published in the club newsletter, revealed a level of obsession that nonbirders would find amusing if not call-the-cops alarming. I thought of that last month when attending a baseball game with my son at Busch Stadium in St. Louis. The Cardinals were playing the Blue Jays, so the evening had an avian quality to it from the start. Before and during the game I was pleasantly distracted by cliff swallows. The sky over the emerald field and bright red seats was full of them. Every now and then I’d spot a barn swallow, too. Was anybody else seeing this? Baseball can be a slow game, and that’s not a complaint. I like the pace. There is plenty of time between pitches to look around and notice things, like birds. Jay and I each observed a robin grazing in left field during the game, and I kept an eye on those swallows until nightfall settled in and the aerial feeding frenzy ended. Busch was the first stop on our six-day baseball road trip through Missouri and Iowa. My binoculars were in the trunk just in case but I didn’t intend to use them. This trip was not for the birds. It was about father-son bonding, baseball, hot dogs, silly jokes and hotel pools. But of course every day contains birding opportunities. There is always something to see. Naturally I began a mental “trip list” as soon as we left the driveway in Glen Ellyn. Watching for birds while driving may at first seem unsafe but I think it keeps me more alert. The key is staying focused on what’s ahead, not to the sides. No rubbernecking! By the time we reached Lincoln’s tomb in Springfield I’d already spotted 15 species, including a flyover green heron. Car birding can really test of your identification skills. You often only have a second or two to assimilate clues such as size, body shape, flight pattern and color. Habitat is one of the best clues of all. Red-winged blackbirds, for example, America’s most abundant species, show a strong preference for roadside ditches and fences. Turkey vultures soar above, looking for roadkill. Bridges attract swallows and pigeons. The list grew quickly as the miles went by. I saw a kestrel hovering, getting set to drop down on unsuspecting prey. Also in the air, easy to see and ID: great blue herons, cormorants and an egret. Starlings, grackles, robins and mourning doves were abundant. Baltimore orioles zipped over the highway like orange and black comets. At Kauffman Stadium in Kansas City, as at Busch, cliff swallows were part of the entertainment. We sat high in the upper deck so most of the bird action was at eye level. Down on the field, the Royals defeated the Cubs. Throughout our time in western Missouri I was hoping to spot a scissor-tailed flycatcher. We were at the northern edge of the usual range for this species, the state bird of Oklahoma. And because it likes to perch on wires, viewing one at 65 mph seemed possible. Well, no such luck, but we did see a few roadside mockingbirds. On our second-to-last day we stopped in tiny Van Meter, Iowa, to visit the Bob Feller Museum. An osprey was circling a small reservoir as we exited I-70, just west of Des Moines—a nice addition to the trip list! As we left the museum I heard the loud trill of a chipping sparrow. I’m not always “tuned in” like some birders but that one was easy. The last game on our road trip was in Davenport, home to the Quad Cities River Bandits. Their little ballpark is a gem, hard along the Mississippi River with a view of Centennial Bridge. It’s a minor league version of PNC Park in Pittsburgh, but without the large buildings. In the Steel City, however, you’d never enjoy close views of American white pelicans flying by as we did at Modern Woodmen Park. What an unexpected treat it was to see these huge, magnificent birds. After the game, in the parking lot, I picked up the buzzy call of a common nighthawk. Jay and I looked skyward, scanning to find the source of this classic sound of summer. Some onlookers probably wondered what we were doing. Maybe a few thought we were a little batty. I love ESPN, even though I don’t watch it at home. It’s not part of our bare-basic cable package. But at the YMCA, when I'm using the treadmill, SportsCenter is my best friend. Especially during baseball season. Of course there is more to ESPN than SportsCenter. On a recent Saturday the network featured a turkey shoot. The clicker was out of reach that morning so I watched. I’m not a hunter, but I’m not against hunting either. Birding and hunting can easily coexist. In fact, one of America’s best-known birders, Pete Dunne, is also a gunner. I’m sure that he shares my admiration for the way waterfowlers support habitat management through the federal “duck stamp” program. Many birders who never lift a shotgun buy a stamp every year and I count myself among them. So I wasn’t offended by the turkey shoot, just surprised. First of all, it didn’t seem all that sporting. In segment after segment, hunters would sneak up on a grazing bird and shoot it. Surely there is more skill involved than came across on TV. The hunters’ reactions after taking down a bird surprised me even more. They laughed and smiled and traded high fives. Being on camera, perhaps they were hamming it up a little. But the scenes reminded me of how birdwatchers sometimes celebrate after spotting a mega-rarity. As birders, we have more in common with hunters than we might care to admit. We don't kill, but we certainly hunt. We get up early, we go outside, we hike, we carry binoculars, we buy duck stamps and a few of us (not me!) even wear camo clothing. I’ve often thought that birders and fishermen share a few tendencies as well. Not that it really matters, but maybe, just maybe, the hobby we love is also a sport. 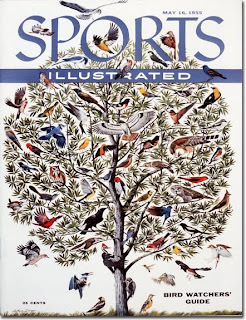 Sports Illustrated once featured birdwatching on its cover. May 16, 1955. The magazine also published cover stories that year about archery, skin diving and hot-air ballooning. Dogs made the cover three times, as did the Princeton University marching band. Examples of the birding “game” needn’t be so extreme. The game, if you prefer, might be as simple as watching bird feeders from your kitchen table, keeping track of what stops by. Or maybe it’s “competing” against an existing list. I record what we see on the monthly bird walks at Cantigny Park and like to compare our results with those from the same month, one year earlier. It provides a benchmark and heightens my awareness of the seasonality of local bird populations. So, game, sport or hobby? Call it what you wish—birding is a bit of all three. I happen to favor “hobby” because it seems broader and more inclusive. Would this column fit better in the Sports section than in Neighbor? Not in my opinion. Birding is many things to many people, and that’s a big part of its appeal. It’s a backyard activity for some and a worldwide pursuit for others. It’s personal and social, sedentary and active, indoors and outdoors, casual and highly organized. You can be a competitive lister, a passive lister or choose to keep no lists at all. Whatever you want from birding, it’s out there. Well, there is one thing missing. Some day I’d like to step on that treadmill and see a birdwatching show on ESPN. I’d even give up SportsCenter for that.